The CG-TA nylon-string and CSF-TA parlor guitar boast reverb and chorus effects without the need for an amp. Yamaha has debuted two new TransAcoustic models, the CG-TA classical and the CSF-TA parlor guitar. Yamaha’s TransAcoustic line offers reverb and chorus effects without the need for an amplifier or other external gear. 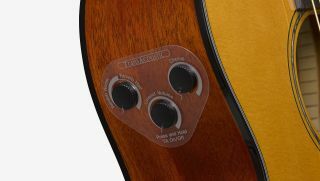 A metal actuator mounted inside the guitar's body reflects the string’s vibrations, enacting reverb and chorusing effects when activated. The CG-TA boasts a classical body with nylon strings, a solid spruce top, Ovangkol back and sides and rosewood fingerboard and bridge. The CSF-TA parlor guitar features a compact body, solid spruce top, mahogany back and sides, rosewood fingerboard and bridge and durable hard bag. The CG-TA is being offered at an MSRP of $1,050, and the CSF-TA at $1,129. For more information, head over to Yamaha.